FAIRVIEW TRACTOR BRINGS MANY SMILES TO ROSEBANK COMMUNITY | Welcome to Fairview's Blog! Fairview recently donated an old Fiat tractor to the Rosebank Village Green community to use in their play park situated on a large strip of grass along the banks of the Liesbeek River. Rosebank (Cape Town) Neighbourhood Watch (RNW) was looking to find an old tractor, as they are busy upgrading the toddler play park in the area. Since taking on this project in September last year, they have had a seesaw installed and two rocking ponies, as well as having the pair of swings refurbished. A small extension to the jungle gym is also planned. These upgrades were possible because of funds raised by the RNW and allocations by their Ward Councilor, Owen Kinahan. The Fairview Trust took the initiative by giving back to the community by providing the children with a tractor to play on and by adding more enjoyment and excitement to the playground. The reason for the tractor is because the area along the banks of the Liesbeek River used to be a farming land, and it is believed that years ago vines were also grown there, albeit a little lower down towards Observatory. It seemed a very good fit with their historic roots! The open space services more than 500 households, drawing babies, toddlers and children from the Rosebank and Mowbray area, and for some it is the only open space they have for playing, as they live in blocks of flats with no gardens. 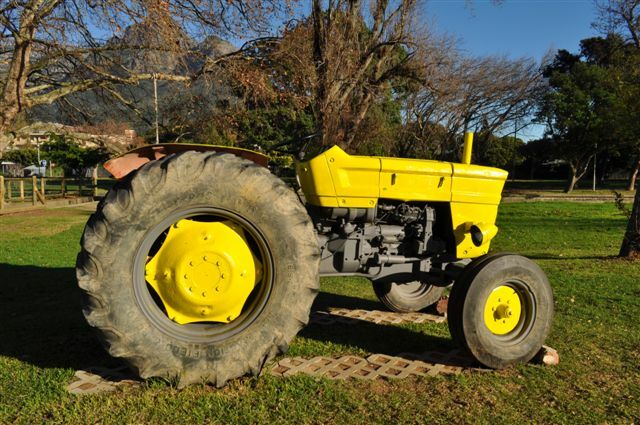 The RNW (Rosebank Neighborhood Watch) has already received a commitment from the City Council that they will provide an assortment of paints, which the neighbors can use to paint the tractor a range of bright colours, as well as a concrete base for it to rest on. The playground and the surrounding community has become a main feature with pride as their newly owned tractor continues to convey its uniqueness in the historical setting.